Some people seem to come into this world looking for ways to provide value to others by advocating for products and services they like. Business Friendships – People do business and refer business with people they like and trust. 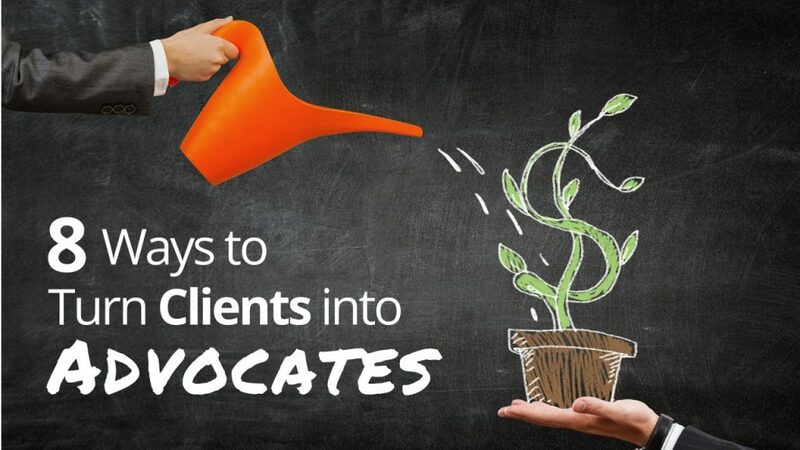 To create Client Advocates, however, a little more is required. You want to create relationships with key clients that go beyond the core work that you do – where you truly get to know your clients and even have fun with them on occasion. Pull Back the Curtain – You help your clients create a vision for themselves related to the work you do – right? (I hope you do. Clarity of vision brings a lot of value that turns into confidence.) As you build your business friendships, it’s totally okay to share a bit of your vision for your business; especially doing so in a way your clients see the benefit to them. Many of your clients will enjoy the opportunity for an ongoing behind-the-scenes look at your business and many will want to play a role in helping you get there. Teach them who you serve the best – One reason clients don’t make introductions is that they don’t know who to send your way; who you serve the best and how to recognize someone who should at least know about you. Teach your clients. Never take this for granted. Teach them how to talk about you – Once they want to help you and know who might fit your business, many might also need a few talking points about some of your more unique processes or ways of working with your clients. Look… some of your clients will know exactly what to say to a friend or colleague to peak their interest in what you do. Sometimes, they need a few ideas of what to say. Teach them how to make a good connection for you – You’ve already heard from me a bunch of times about how important it is for you to have your referral sources make strong connections (introductions). The good news about Client Advocates is that they are super willing to do this. Sometimes they just need to be taught how. Teach them how you’ll handle introductions – One concern that many clients have, until you teach them, is how you will handle the introductions; how you will reach out to their friend or colleagues; what you will say; how professionally persistent you will be; and how you will keep them in the loop. They need to feel safe in sending people your way. Ask for introductions – You didn’t think I’d leave this off the list did you? Whenever you identify someone in a client’s life you think should at least be aware of what you bring to the table, don’t be afraid to broach the subject. The easiest introduction to ask for and get is the introduction to someone your knows well. Celebrate Your Advocates – Host appreciation events exclusively for your advocates. Some firms with whom I’ve worked have established an “Ambassador Program.” When your advocates come together, they all leave as even stronger advocates. Once a year you can send them a thankyou gift related to one of their personal interests or even their children or grandchildren. When you tailor a gift to them, you get a whole lot of bang over very few bucks. PS – Don’t keep these ideas a secret. Tell your colleagues and business-owner clients. This entry was posted in Get More Referrals and tagged advocates.